Getting rid of junk can be habit-forming. Well, okay, it’s probably not a habit that would form all by itself. You might have to work at it. You might have to practice day after day for an entire month for getting rid of junk to become a habit. And that’s the idea of the March of Trash Challenge. Throw stuff away every day for an entire month. For the month of March, look at your possessions day after day and find the things you aren’t using. Put them back into use, or throw them away, or pass them along to someone else who would use them. By the end of the month, you’ll have tallied at least 30 items in these three categories. That’s what you’ll do if you accept the challenge. I know, it is not a super-big challenge. You might even be thinking you could do all that in just one day. But the idea is to create a habit by returning your attention to your stuff day after day, and taking action on it day after day. Besides, deciding which of your things you’re ready to let go of can be harder than you would expect — but it’s still easy enough to do if you approach it a little at a time. 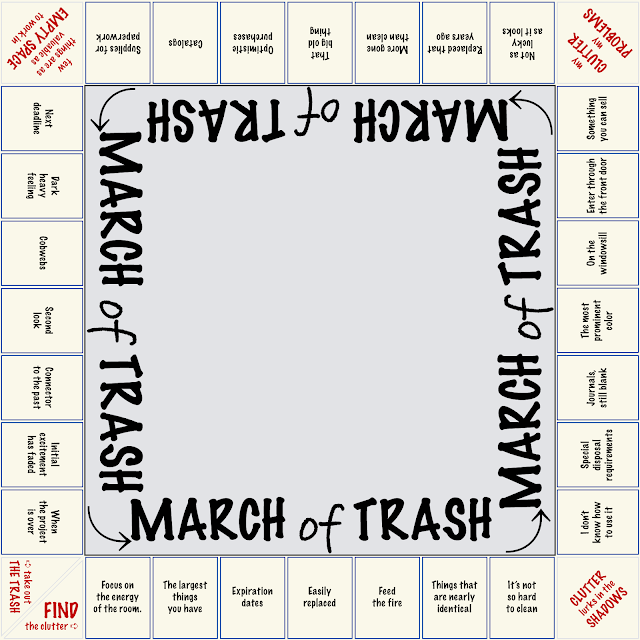 To make it easier to keep track of your progress, I’ve created the March of Trash Scorecard, which you can download below. Fill in the scorecard with 30 items over the course of the month and you’ve completed the challenge! It can be harder than you would think to find the possessions you aren’t using, so every day I’ll be posting prompts, or suggestions of things to think about, at the Take Chances Pay Attention blog. I’ll keep up a running commentary of the month-long challenge here at the Fear of Nothing blog, where you’re welcome to add comments about your own progress, ideas, and obstacles. If you’ve read this far, I’m confident that you’re up to the challenge, and so I’d better get into the practical details already. Putting things back into use can take a considerable amount of time, so it can’t be the answer for everything. For some things you have, you just don’t have the time or the interest to use them yourself. That brings us to the next category. You don’t want to take up too much time figuring out how to get rid of something, so if it seems complicated, often the simple answer is to throw it away. Whatever the details of the way you get rid of something, the result is more free space for you to use. You will also find that you have more time with less stuff around, and you’ll have a stronger focus, as you are better able to focus on the work you do with the fewer possessions that remain. When you think about what you really want to accomplish, it can help you discover some of the possessions that you don’t really want to keep. 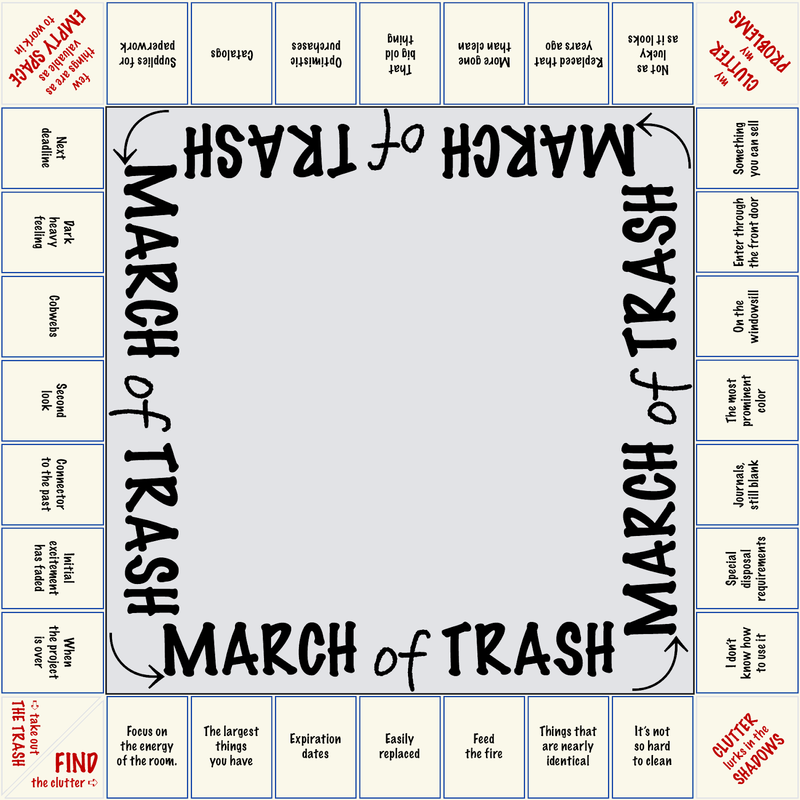 Space, time, and focus are the ultimate objectives of the March of Trash Challenge. Throwing junk away, moving the trash out, is just a means to an end. There you have it. Find your unused, neglected possessions, and get them moving again, and when you can’t do that, then at least get them out of the way. Do this day after day for the month of March, and there’s a good chance it will become a habit. Good luck! Download the March of Trash Challenge Scorecard.